Way to go, Taeyeon!! Great leaders can’t stand alone and you always have the members on your mind even if it’s only because their butts look good in that outfit! We will always follow you. Happy tears, I hope =) It was my wallpaper for the longest time and I sometimes would catch myself just gazing at it for minutes at a time lol! If possible, all SONEs would continue that line, hand-in-hand. a leader doesn’t have to lead but sees through it that that her group is well-taken care off at all times :). i remember that one fan account when the girls went on their first japanese music program to perform “Gee…” she said that during the break, she saw how Taengoo was lining up all the girls with their sitting arrangements. that was the first time a fan saw how she actually makes it a priority to have the girls in their best behaviour :)…love that about her! The 3rd member from the right, probably yoona, has a very creepy neck ! wooowww…go taeng noona!! You are my role model. WATCH THIS! SNSD IS SOOO GOOD AT DANCING! Taeyeon forever way to go!! woot woot! tae tae jjang!! soshi bond is the best! show more of yr leadership this year, make it more power! That picture prompted me to open up my actual First Photobook to find that big foldout picture. It is very symbolic of her leadership, with a laid back yet effective leadership style and the girls willingly and happily following. I miss Taengoo with long hair. As with the poll, we already know she’s a great leader, I didn’t need the poll to prove it to me, but it was nice to see the acknowledgement. Loved the title… keke… And that picture at the end,its so nice…xD the nicest picture i ever seen..
i just realised that Seobaby looked really short in that pic. maybe because she tilted her body. Taengoo will always be the best leader in our hearts! By the way, saw this advert in one of our Singapore shopping malls today and just thought I’d share it with you fellow SONEs. 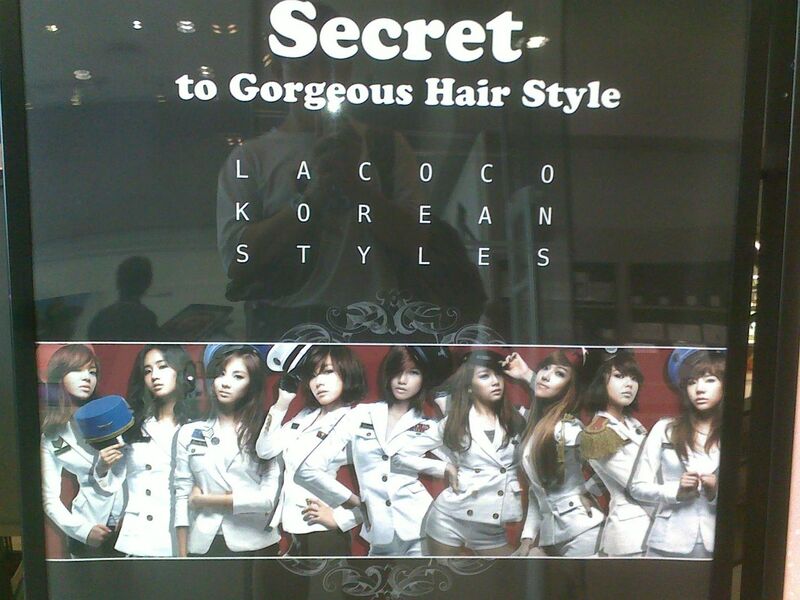 Its a ad billboard at Orchard Central Mall for a Korean hairdressing salon and features the images from the “Genie” single. Cool, huh 😉 ?!!! Sorry, here’s the photo ;). Taeyeon totally deserves this first place win. She is one of a kind! Comparing her to the great leaders throughout human history would prove to be… Shall I say, a futile dispute? Since there’s absolutely no comparison between Taeyeon’s remarkable leadership skills in her role as the leader of Girls’ Generation in her ‘respective area’ and… Whatever great leader there is probably leading a long-standing army of the world. Of course, one would bring up the argument that said great leader(s) accomplished more than Taeyeon in terms of historical achievements. How people aren’t aware of the much grander scale of things, the attention it derserves, and the standard of leadership (Or whatever) is declining due to contemporary cultural relevancy or some other stuff like that. But I realized, only people who are nostalgic or reminisce too much about that (Glory days?) and how others aren’t buying in/interested in what they’re trying to do would say that. I would say this is Taeyeon doing her best as a human being for her generation. There’s no comparison between her and those who have earned their place in history. Think of it as supplanting them and as a continuation of the glory of leadership in conjunction with today’s time. History is something which will remain here forever, the only problem is the acknowledgement. Even though nobody in today’s world would seem to care about that, Taeyeon is carrying on the role of leadership and presenting it in her own little way and setting an example for others. Kind of carrying on the legacy of leadership, as long as someone is doing it, it never dies out. That being said, Taeyeon very much deserves to be at the top spot. It’s no use trying to remain in the past or the present, always look to the future with brightness, conviviality and hope. With Taeyeon, SNSD and among many others and their distinctive attitudes in your life, to lead the way. It’s only a matter of whether you want to make an effort or not now. *…And there’ll always be someone to relate her character to something else, in this case, history and leadership. I know I will, that’s why it never dies out. *History is something that will remain here forever and is everchanging. Way to go Taeyeon!!!! Saranghae! Taeyeon is the best leader. Wow, I know that she’ll win a poll like this but I really didn’t expect her number of votes will be 4 times the second place. Way to go, Taeyeon, SNSD. our taeng is always the best! fighting !!! !